CHI brand flat irons are ergonomically designed to make the process of hair straightening a lot easier. You can get an interesting look in a short time by using one of these flat irons. 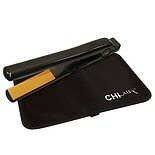 Chi flat irons allow you to straighten your wet or dry hair easily. You can get frizz-free, smooth and shiny hair in just a few minutes. Ceramic flat irons provide a straight and smooth look by straightening your curly, unruly or thick hair. Ceramic flat irons and curling irons use ceramic technology to lock the moisture into your hair and protect them from the high levels of heat. Don't worry about travel as portable mini flat irons can make styling bangs or adding curls a simpler task. Mini flat irons with ceramic fights frizz and minimize the damage caused by the heat. Chi Air Smart irons heat up quickly and evenly allowing you to create luxurious curls and smooth styles instantly. Chi Air Smart irons repel humidity while locking in essential moisture. These types of Chi flat irons can be used on all types of hair. Chi Air Flash irons provide an unparalleled shine to your hair. Once you are done giving your hair the perfect look, keep your hair straight with styling products from Walgreens.com.